So apparently it is "fall" all around America. Target has the Pumpkin Spice M&M's and Candy Corn on display. People are putting out door wreaths and taking in summer patio furniture. 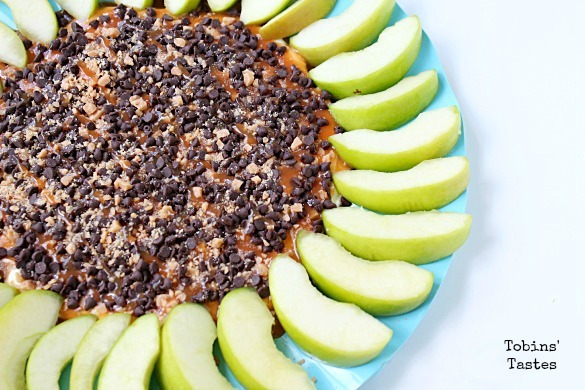 Every other post on Pinterest is fall this or pumpkin that. But here in South Florida? It's humid, sunny and 90 degrees. Not quite my idea of fall. One thing fall-ish I can get into are apple desserts. Not Hot Apple Cider type treats but cool, crisp apples and no need to turn on your oven treats. And this Caramel Apple Cheesecake Dip fits the bill. This was actually the very first recipe I ever posted on the blog. And since it's been a few years and a name change, I think it is high time I reposted this recipe with photos that don't look like they were taken in a root cellar. 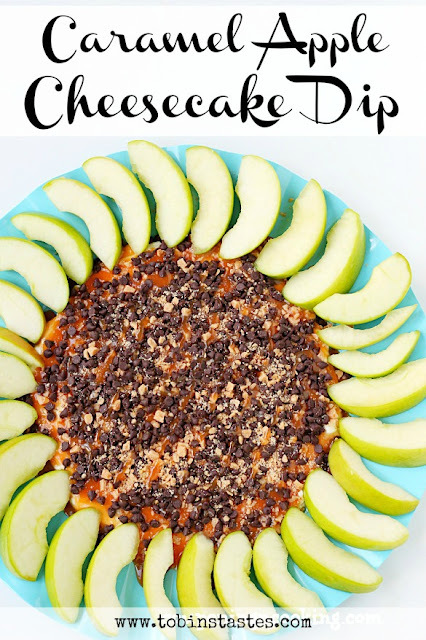 Caramel Apple Cheesecake Dip is one of those recipes that people see set out at a party and are like, "Oh, apple dip how healthy!" And then they take one bite and realize that the only thing healthy about it is the apple slice they are using as a shovel to get the dip into their mouths. And once the apples run out (and they inevitable will, because really, who ever gets the dip to dipper ratio right?) 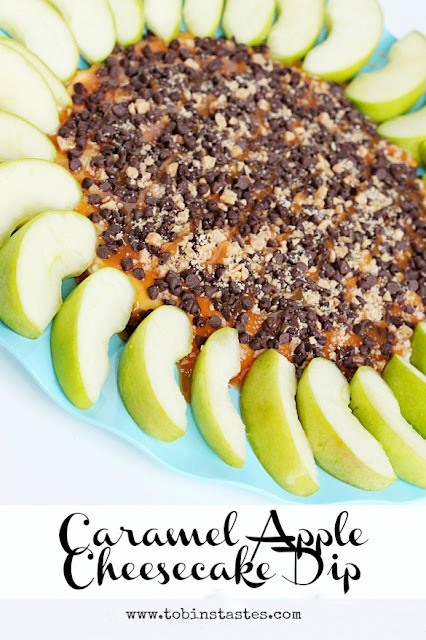 people will start using spoons, forks, knives, cookies or even their fingers if the evening gets late enough to scrape every last bit of caramel covered, powdered sugared, cream cheese off the plate. And why shouldn't they? The apples were healthy. 1.) Beat together cream cheese and powdered sugar until smooth. 2.) Spread mixture onto a serving dish and smooth out into a thin layer. 3.) Sprinkle on chocolate chips and toffee bits. 4.) In a pretty pattern, drizzle on the caramel sauce to lightly coat the candy pieces. 5.) I chill it in the fridge for an hour or so before surrounding it with apple slices and serving it. Want more apple recipes? 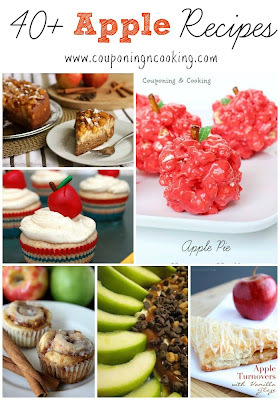 Check out my An Apple A Day Pinterest Board! 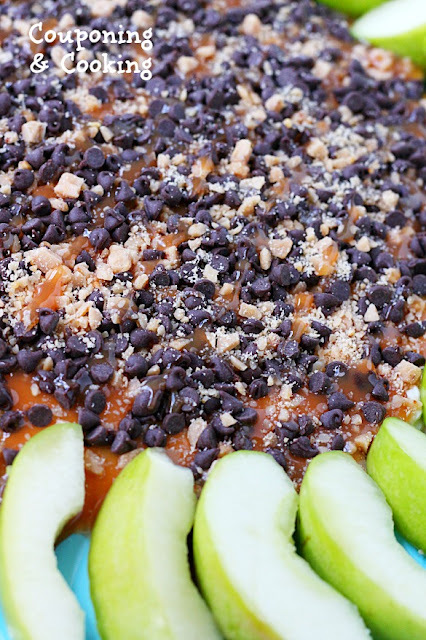 Or check out my Apple Recipes Round Up Post!